Once upon a time, there was a young woman….. . It was the drum roll of thunder that made her put the book down and look outside the window. In the horizon, she could see dark clouds gathering. Rain looked imminent. She picked up her coffee mug; there was about a quarter of a mug left, but it had gone absolutely cold. She hated drinking coffee that had gone cold. S*#^, I’ll have to get up and make another one, she sighed. It would be her third cup in almost two hours – she was getting addicted to drinking coffee – but then, she needed the coffee, especially when she had a book review deadline to meet. Some books went on and on and coffee helped her wade through the pages. A few months ago, it had been cigarettes. Somewhere, she had read that drinking too much coffee wasn’t good for you and she had been drinking quite a few. Any day better than smoking cigarettes, she told herself, as she spooned the coffee granules and the sugar into a mug and started beating them with a few drops of milk. By the time she returned to her rocking chair with the coffee, the wind had picked up, bringing with it the earthy smell of wet mud. On the terrace below her apartment, she spotted Mrs. Joshi collect the papads she had left out in the sun. In the balcony opposite her window, she saw the maid hurriedly gather the clothes left to dry out on the clothes line. The people on the streets too were casting anxious glances toward the rapidly darkening sky and hurrying along. This was the reason she loved reading by the window. The large French window not only let light in through the day and served as a work desk of sorts, it also afforded her a great view. The scenes of real life on the streets below and around her often offered a welcome respite from the monotony of reading printed words of different sizes. Get on with the book, she commanded herself. Only 97 pages left, hopefully I should be through with it by 7. Within minutes, it had started raining in sheets. The wind had changed direction and a fine mist of raindrops started coming in on her face through the open window. 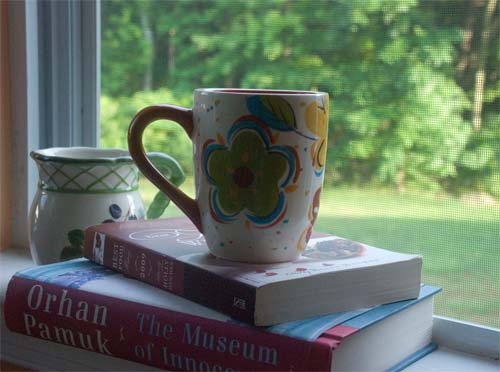 She hurriedly shut her book, put it on the window sill and placed her mug right on top of the book, and closed the window. How can you treat your books so shabbily, as if they were coasters, he would have said. And what is with this closing of the window? A beautiful shower is meant to be enjoyed. Come lets go for a walk in the rain, he would have insisted. Mohit. Much like a pebble stuck in the sole of a shoe that you want to but cannot get rid of, Mohit was ever present in her thoughts. She had walked out of his life almost a year ago, but every single time she did or didn’t do something, she was keenly conscious of what he would have said or done. Please God, make him call me, she would pray. Many a times, she wondered if she should swallow her pride and ego and write to him instead. But she every time she started to write to him, his words came back to her. Just get the f*#% out of my life. I don’t want to see you again, he had said. Her mailbox was brimming with mails written to him but never sent; she had decided that she wasn't going to be the one to take the first step. Call me Mohit, call me. I will come back to you in a heartbeat. Just call me once, she pleaded fervently, opening the window and letting the mist of raindrops wet her face. Thousands of miles away and in the land of the Big Apple, Mohit woke up with a start. It took him a moment to realize that she wasn’t really there with him and that he had dreamt of her, again. He saw her very often in his dreams but this dream seemed so real that he felt as if she was there, right next to him. After tossing and turning on the bed for a while, he realized that there was no point in trying to sleep again. He lit a cigarette and walked into the kitchen, mixed the coffee granules, sugar and milk together in a mug and blitzed it in the microwave. Even as he did so, he could feel her shake her head in disapproval. Tch, tch, tch....That is no way to make coffee.. You need to beat it and beat it well. Bring out its flavor. He could picture her even now, her night suit clinging to her body, her hair short, tousled hair and the complete concentration on her face as she beat the coffee. She was passionate about her ‘one cuppa a day’ and was very particular about how it was made. When the milk came to a simmer, she would add a couple of crushed cardamoms to it and then pour it on the beaten coffee. Smell it first, she would command. Take in the aroma. Then sip it. Nice, isn’t it? Now that is the way to make and drink coffee. The microwave’s loud beeps pulled him out of his reverie. As he sipped the tasteless coffee, he wished, once again, that he had never uttered those words. Or at least apologized soon after. Or begged her to come back. But he had done nothing of the sort, forever and, a little arrogantly, hoping that she would call him. She hadn’t and he couldn’t fault her for it. Like many times before, he contemplated giving her a call. It was a number that was etched on his mind and he punched in each digit with deliberation, but paused before he hit the dial key. What if she doesn’t take my call? What if she tells me to get lost? What if, horror of horrors, she has found someone else? And so he went cancel,cancel, cancel on the phone till he had erased each digit of her number. I am waiting for you to call me, he said,staring into empty space. Call me once and I will be there with you in a jiffy. BongMom was hosting Of Chalks and Chopsticks for July, the picture above was the cue she gave us this month around which to spin a yarn. The moment I saw her picture, I thought of the Pink Floyd song Echoes; this one line kept playing in mind over and over again - So I throw the windows wide and call to you across the sky. That then, has been the huge inspiration for this story. I didn't even know it was called "Indian Espresso" until a few years ago. I had always known and called it "beaten coffee". And that's what you need to do to make a cuppa. Beat the coffee and sugar together till it is creamy and frothy. Take a mug, add (instant) coffee granules and sugar to it - according to your personal preference, add a few drops of water/milk. The mixture should ressemble wet sand. Using a spoon or an electric beater, start beating the coffee and sugar. Add a few more drops of water if the mixture is too dry, but add the water only a few drops at a time. Pour steaming hot milk (I add a couple of crushed cardamoms to my coffee - but this is completely optional) till the mug is half full and stir well. Then pour the remaining milk. Refrain from stirring too much or it will lose the bubbly, frothy look. Sip it slowly, savouring the aroma and the robust flavour of coffee. Enjoy! I'm not a coffee drinker, but you have convinced me to try the beaten coffee soon. It looks frothy and delicious. Yummy pics. Love the coffee, though like your hero I neve have the patience to beat it thoroughly. PS: I liked this way of writing the story from two different angles. Wish I had thought of it. Wow lured ur story and the coffee too,.. I've never heard of an Indian espresso till now, and this is the first time I've heard of beating coffee - but then my coffee experience is restricted to one cup of canteen coffee a day - I don't stock either tea or coffee at home unless people are visiting. Jaya, I am glad that you liked the way of writing, I agonised over this story for 2 full days before publishing it, precisely because of the way I had narrated it! Notyet, thank you very much. Sharmila, I had the rains in India in mind, the description pretty much matches what I can see from the window in my room back home. Seema, that is really the way some relationships work (or don't). Glad that you liked the ending too. Torviewtoronto, not too many people like coffee with cardamom and it does take some getting used to. Tell me if you like it. In its original form, the story had a happy ending, but it was too long and sounded too contrived, so I changed it completely. Cooking Foodie, you flatter me and trust me, I have been smiling eversince I read your comment. If I do end up writing a book, you'll be amongst the first to receive a copy. Promise. Is this made with fresh ground, or instant coffee? Sounds delectable. Anonymous, this is made with instant coffee. Thanks for your comment, have also mentioned the same in the post. beautiful story. am always scared of misunderstanding and its effects on our lives.